Great cyclists are born, but winning cyclists are made by the brains of their managers. The craft of racing requires a non-stop obsession with detail: watching rivals, judging the strength of a break, knowing the course, and picking the right moment to seize a fleeting opportunity and turn it into a big win. 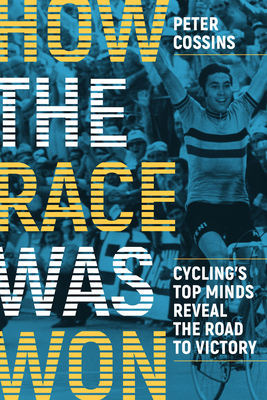 How the Race Was Won investigates the fine details of bicycle racing through extensive interviews with the sport's brightest minds. Author Peter Cossins has interrogated the riders, managers, and directors who have shaped the sport, and reveals how they learned to navigate the invisible undercurrent that sweeps their riders to the finish line. From the moment when George Pilkington Mills was paced to victory by a wily teammate in the 1891 edition of Bordeaux-Paris to Chris Froome's modern emphasis on marginal gains, How the Race Was Won embraces the full sweep of cycling history, making stops along the way to analyze how tactics first evolved and how today's winning minds continue to build on what came before. Behind every great cyclist is a race wizard reading the race, watching the rivals, outwitting the competition, and anticipating the one perfect moment to launch a rider to victory. How the Race Was Won is a thrilling and unprecedented look at how victory is won, how rivals are vanquished, and how pure speed can only prevail when supported by deep brainpower. - Author Peter Cossins is a veteran cycling journalist for Procycling and the UK's most-read newspapers. - Publicity and advertising in VeloNews; Bicycling; Peloton; and key cycling websites.- Insider access to team managers; riders; and directors lends insight to the decisions that win races.